This is how a day in Rumorlandia goes. A rumor is spread. Then another. And so on. And here’s the latest. 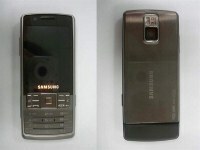 Th FCC website is source of yet another leak of an unannounced handset - the Samsung B5100. This little fellow is the newest Symbian running Samsung device and we have some details on it to share with you. The Samsung B5100 is not only sleek but also quite smart s well - packing Wi-Fi and Bluetooth as well as HSDPA support. B5100 also features a built-in GPS receiver and a 3-megapixel snapper with LED flash. Next on the list are the microSD card slot, the QVGA display (no word on size, though) and the DivX support. A nice touch is the stylish design, especially the metal back cover which reminds us of the Samsung i7110 which you know well since we took a closer look at it right after its announcement. Though nothing spectacular on its own, the Samsung B5100 still seems to be a nice and hopefully affordable smartphone and we certainly like to see more of those come in the bar form factor. Its price and availability are still a mystery. its not update.its asking a create a server profile asking? It's been released a while ago, but pretty much under the radar, and only in a precious few places, like Germany. Since I'm no fan of touch-everything I liked it, got one, and never looked back; It does everything I need it to and quite well.